I made this to take on our picnic this afternoon, and it was so quick and easy. Asda is selling six individual jelly moulds for £2, so I bought some this week, and the recipe fitted exactly into two of them. Heat the skimmed milk in a pan with the sweetener until just boiling. Sprinkle on the jelly crystals and whisk until thoroughly combined. Add vanilla essence and leave to cool. Gradually stir in the yogurt and put into individual jelly moulds. Finely chop the mango and mix with the passion fruit pulp and seeds. 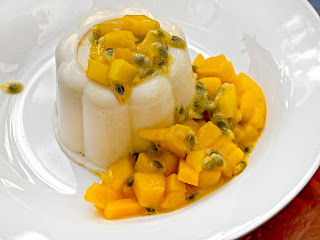 When ready to serve, invert the jelly mould carefully and serve with the passion fruit and mango mixture.